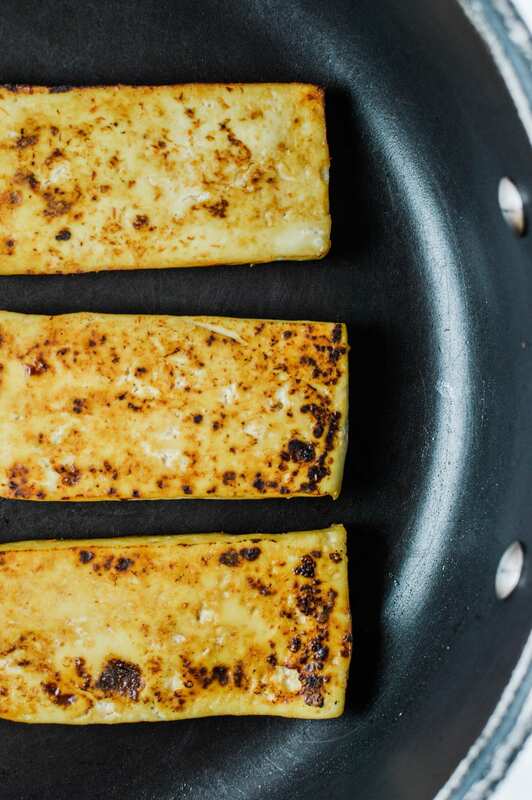 Curious how to get your tofu crispy every time? 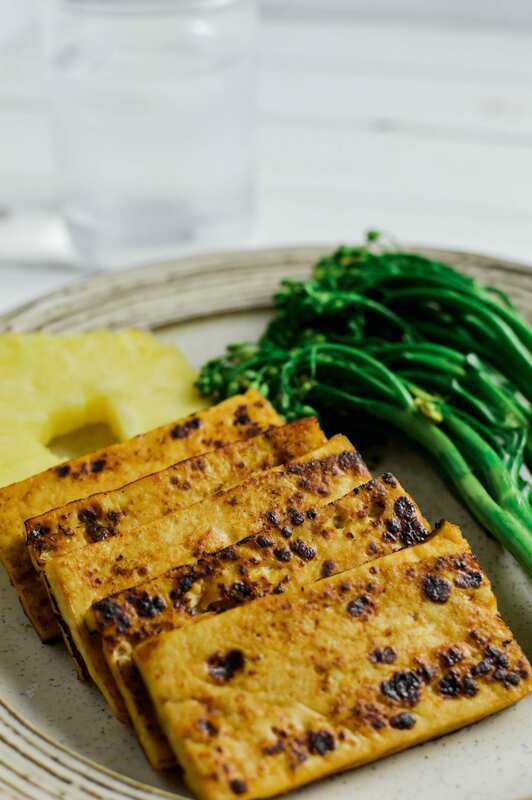 I’ll teach you in three steps how to cook perfect crispy tofu using my Sweet Pineapple Tofu marinade. 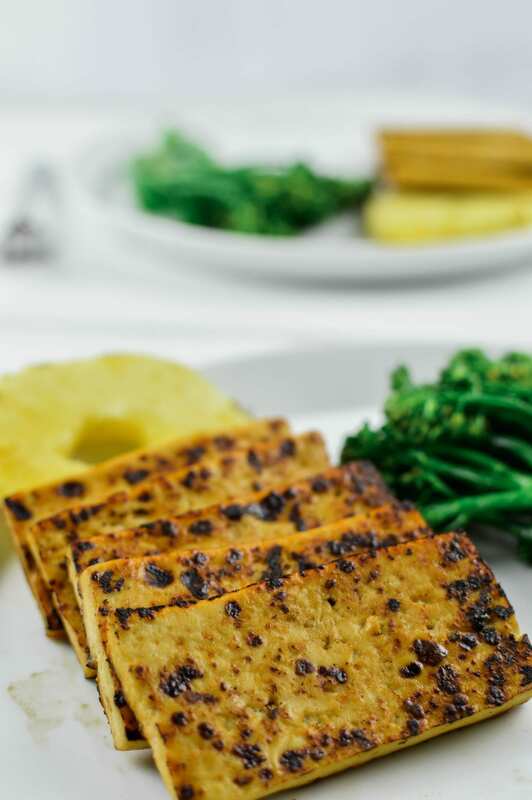 Tofu is an excellent food choice for vegans, vegetarians, and health conscious omnivores alike! 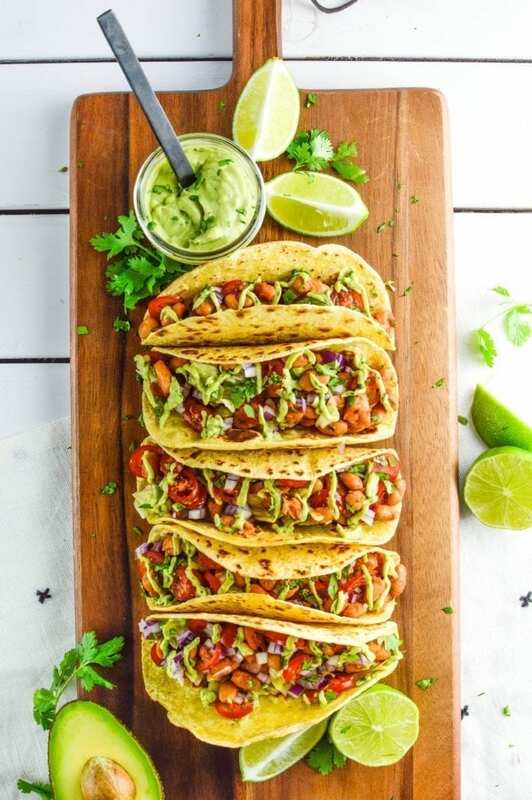 It’s one of the few, high protein plant foods available today and has incredible health benefits; mainly through disease prevention and aiding in weight loss. 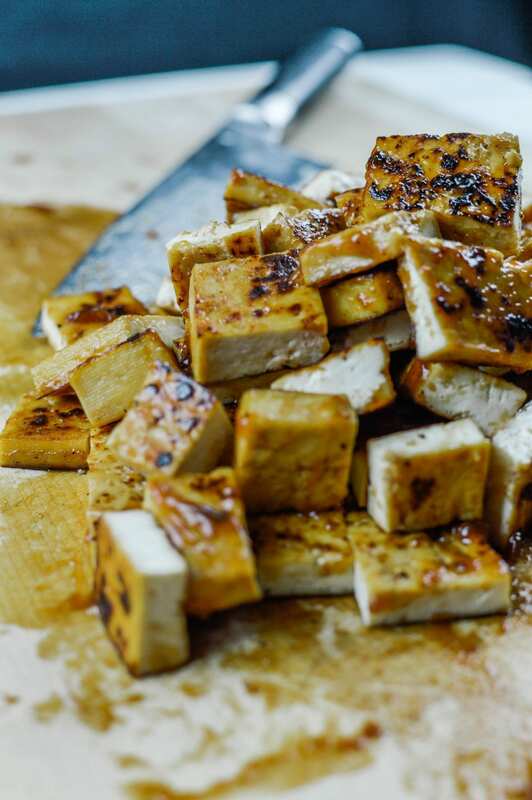 Tofu originated in China over 2,000 years ago. It then quickly spread all over southeast Asia to countries like Japan, Korea, Vietnam and Thailand. Around that same time, during the Buddhist revolution, tofu became an essential food within the vegetarian diet. Because of that, healthy eating continued to take off and it was quickly introduced to the West during the 1960’s. It never really took off until recently. 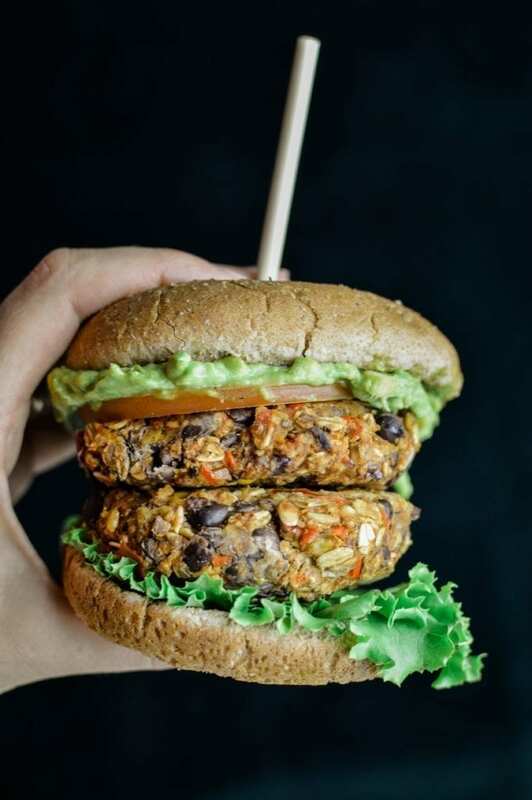 Thanks to the recent boom in the popularity of plant-based diets, tofu and other soy based foods have been brought back into the limelight. Tofu comes from soy milk (pressed from soy beans) and then curdled into soft white blocks. Those blocks typically come in many varieties: soft, medium, firm, extra-firm and silken. The first three varieties are most common in main courses, while silken tofu is best utilized in sauces, smoothies, and puddings. As mentioned earlier, tofu is a superior plant protein source, but it also contains beneficial vitamins and minerals. Manganese: 31% of the RDI. All those vitamins and minerals account for its health benefits. 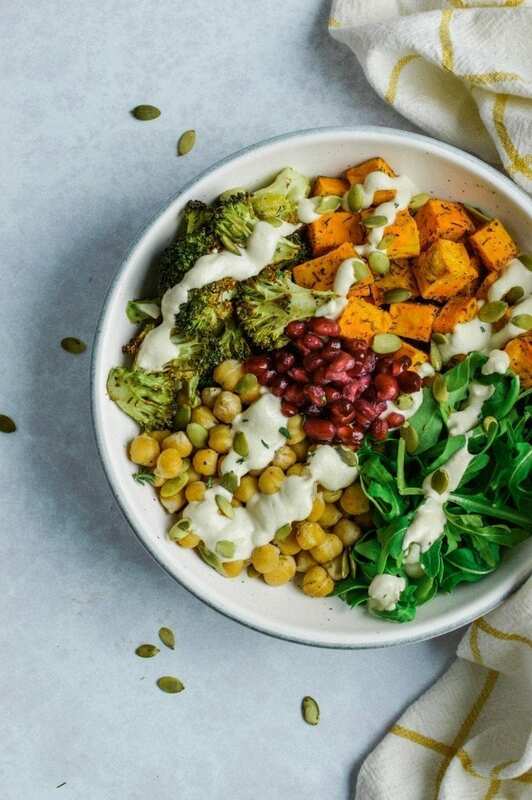 In fact, research shows that women who ate soy products as a child and as an adult had a 24% lower risk of developing breast cancer, compared to those who ate soy during childhood alone. Another study observed that higher intakes of tofu were linked to a 61% lower risk of stomach cancer in men. Pretty powerful benefits from a bean! Now that you know why you should eat it, learn how to make it! First, squeeze the water from the tofu. Take the tofu out of the package, drain excess water, and wrap with paper towels or a clean dish towel. Second, place the wrapped tofu in between two plates and top with something heavy (I used two cans). Allow to press for 15 minutes. During this time, prepare your marinade. 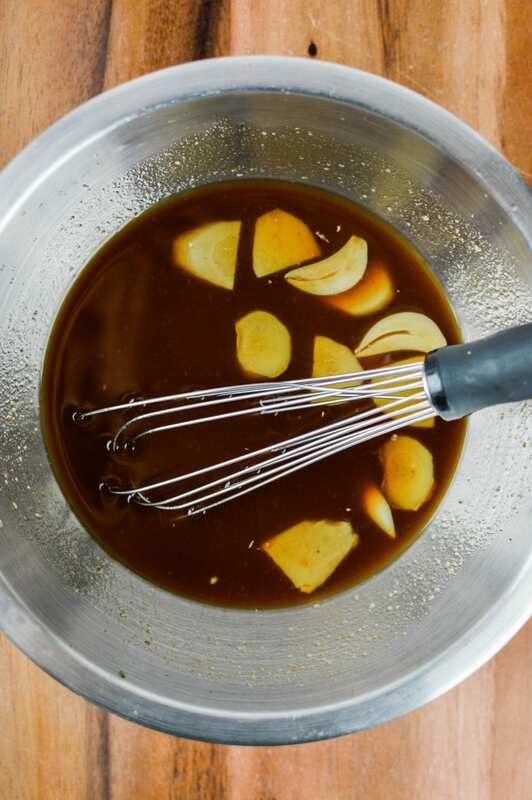 After you chop the garlic and ginger, pour all ingredients in a medium sized bowl and whisk to combine. 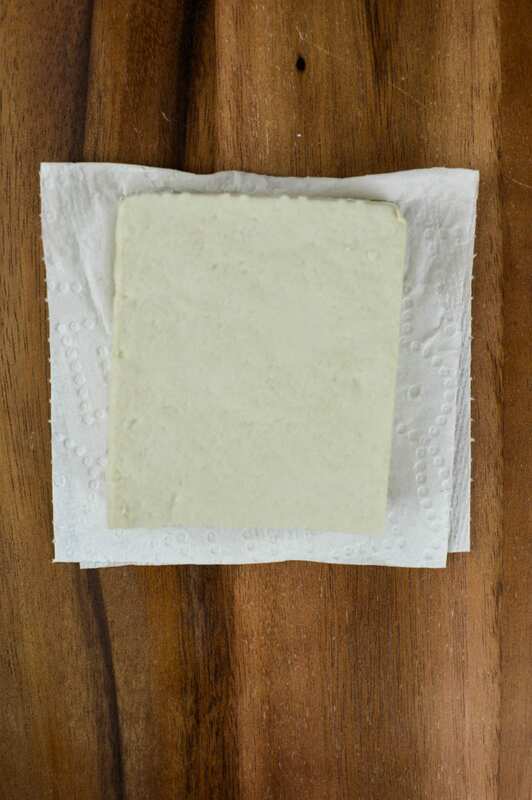 After you tofu is finished pressing, unwrap it, place on a cutting board, and slice into squares, ½” thick . 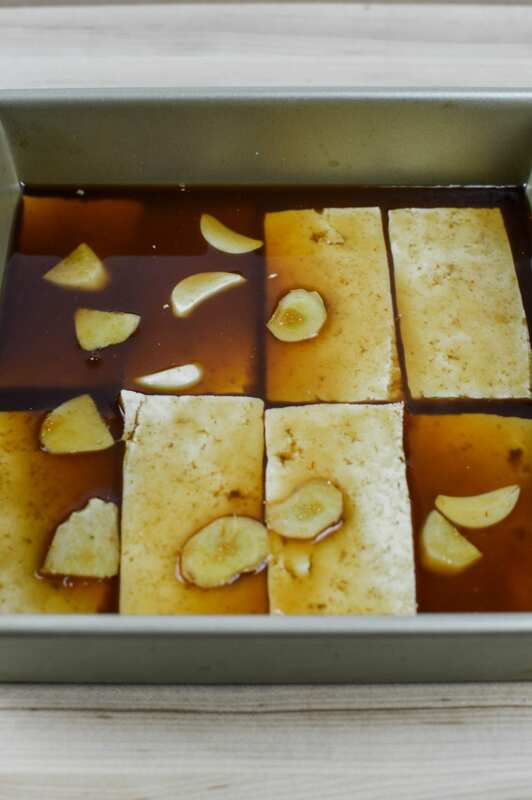 Place tofu into a flat baking dish and pour in the marinade. Swish around lightly to coat. Alternatively, you can flip the pieces to marinate both sides. 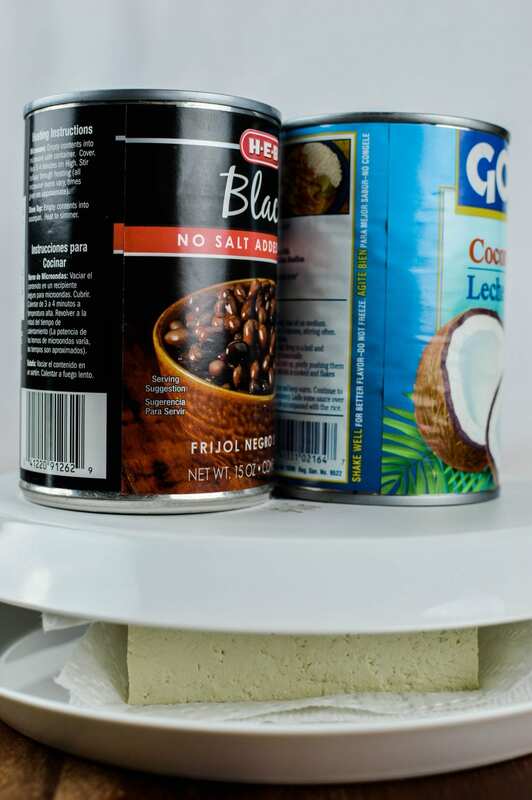 Cover with a clean dish towel and marinate for a minimum of 15 minutes, the longer the better. (the longer you let it soak, the more the tofu will absorb the flavor of the marinade). 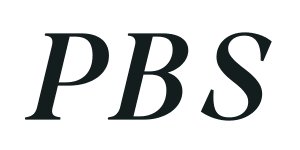 Five minutes before you plan to cook, heat a large skillet over medium-high heat (for numbered oven dials: between 6-7; for temperature dials: between medium and high). Once hot (test by splashing some water on your pan. If it sizzles, you’re ready), add two tbsp vegetable oil. This is an important step. Normally I use less oil in recipes, but the tofu needs it to crisp properly. 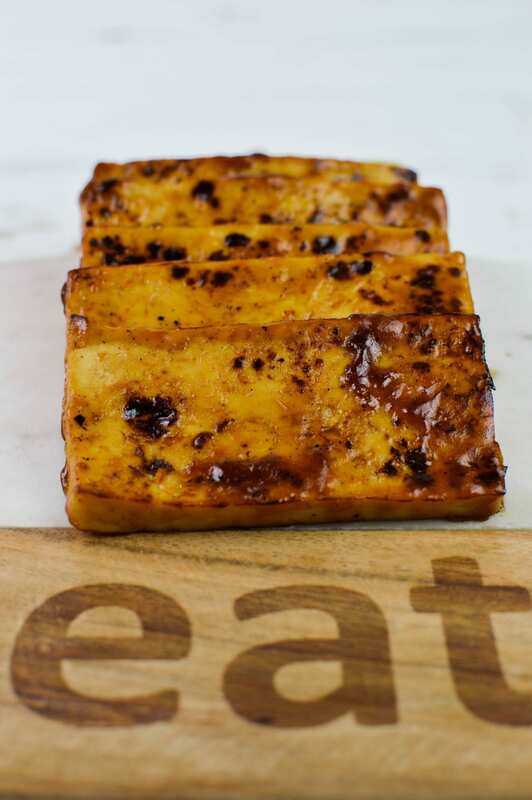 Fry tofu for 8-10 minutes on each side, coating with extra marinade a couple times. Don’t flip until the first side is fully crisped. After frying both sides, remove from heat and place tofu on cutting board. Serve as is or chop to desired size. 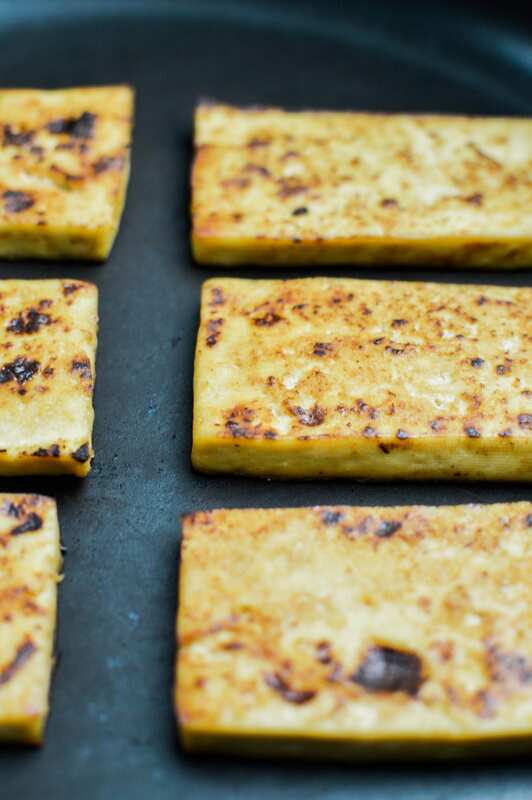 An alternative oil-free method: Bake tofu at 450 degrees for 15 minutes. Then remove from oven, coat with half of the marinade, and place back in oven for an additional 10 minutes. Remove once more, coat with the rest of the marinade, and finish it off in the oven for five more minutes (keep a close eye on the tofu toward the end so it doesn’t burn). While eating this alone would still be delicious, it’s best be served with sides like some sliced pineapple and sautéed broccolini. Alternatively, you could eat this with my Sweet and Spicy Sweet Potato Fries, brown rice, or other vegetables. If you have leftovers, store them in an airtight container (I like these) for 2-3 days. 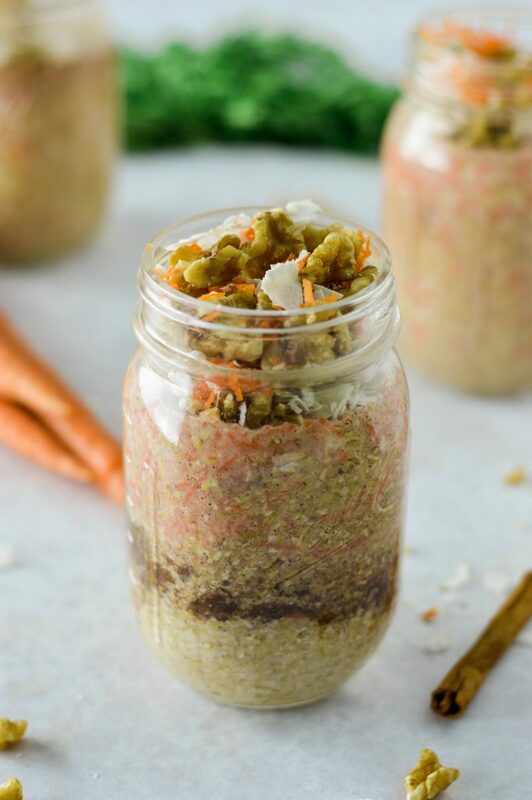 If you make this recipe, please share using the social media buttons in your browser! 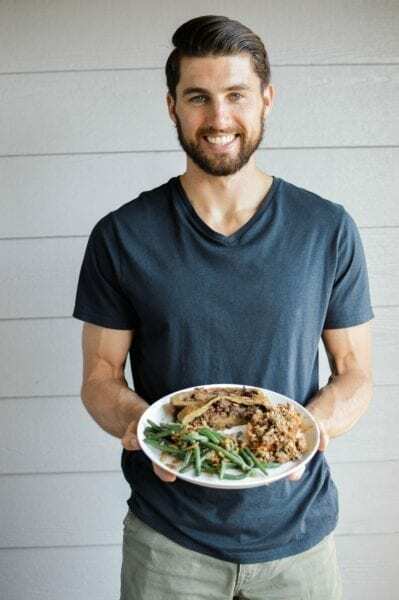 Also, don’t forget to use hashtag #plantbasedscotty on Instagram! 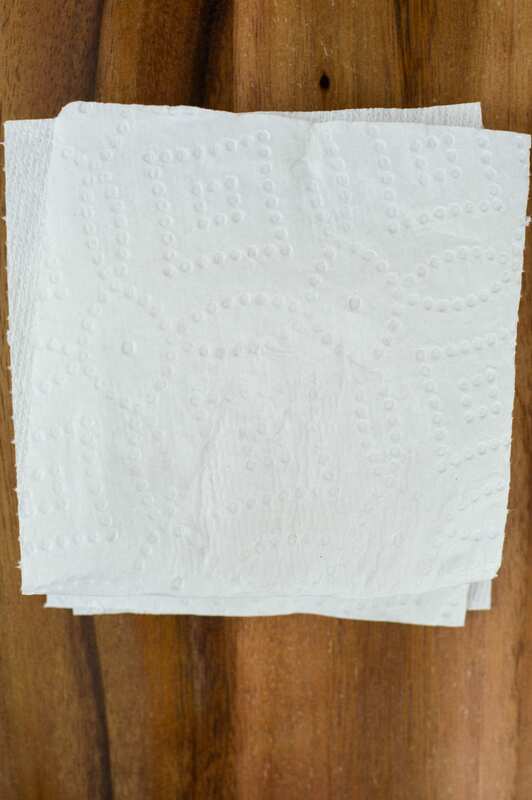 Wrap tofu with either a clean dish towel or paper towels. Place the wrapped tofu in between two plates and top with something heavy to slowly press out the water. Let tofu sit for 15 minutes. 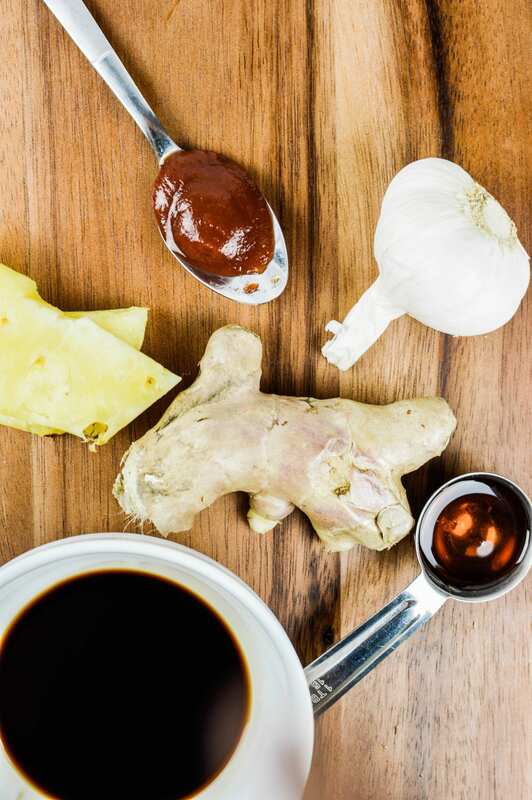 Prepare the marinade by adding all ingredients in a medium sized bowl and whisk to combine. After tofu is pressed, slice it into large squares (about 1/2" thick). Add tofu to marinade, cover, and allow to sit for a minimum of 15 minutes (the longer it sits, the more flavorful it becomes). Five minutes before it's done marinating, heat a large skillet over medium-high heat. Once hot, add vegetable oil, then add tofu and cook for 8-10 minutes each side (periodically top with extra marinade). Serve hot with your favorites sides!